I am honored to be asked to continue writing my column for novice reef hobbyists in this exciting new venture called Advanced Aquarist. While planning for this first installment, my attention was once again drawn to the question that began my very first Reefkeeping 101 column (see http://www.reefs.org/library/aquarium_frontiers/Reefkeeping_101.html for 101 columns) for Aquarium Frontiers On-Line: What place does a beginner’s column have in a magazine dedicated to the” advanced aquarist”? In answer, I ask you all to consider your own humble entrance to this passion we know as reef-keeping. I for one was wide-eyed, giddily enthusiastic and largely clueless regarding the practicalities, realities and demands of the successful reef-keeper. It took a long time and much trial and error before I was finally able to sort through and make sense of the flood of complicated and seemingly contradictory information coming my way. I had my share of difficulties and unnecessarily jeopardized the lives of far too many beautiful creatures. I learned a lot along the way, but it took quite a while to be in a position to meaningfully engage the level of material presented in the rest of this outstanding publication. Patience and thoughtful planning are important factors in achieving a stable and long-lived captive reef. Pictured is a close-up of the center section of Pratt Reef highlighting a pleasing mixture of hard corals, soft corals, clams and fish. The 11/2 year old, 210 gallon reef system known as “Pratt Reef’ is located in the Writing Center on the Pratt Institute campus in Brooklyn, NY. Highlighting aquacultured and captive bred organisms, the system design and maintainance practices follow closely the general philosophies and recommendations to be detailed in this column. In short, “advanced aquarists” don’t become advanced over night. It is my hope that this column will provide the foundational information necessary for novices to thoughtfully design, build and maintain healthy, responsible reef systems. To do so, I will rely on my own experience, the anecdotal evidence of the many aquarists that I know, and the expert advice of the other authors of this publication. By keeping the discussion practically oriented, and relatively non-technical, beginners can start to achieve success with a minimum of heartache and more quickly “advance” to the more complex issues of reef keeping. 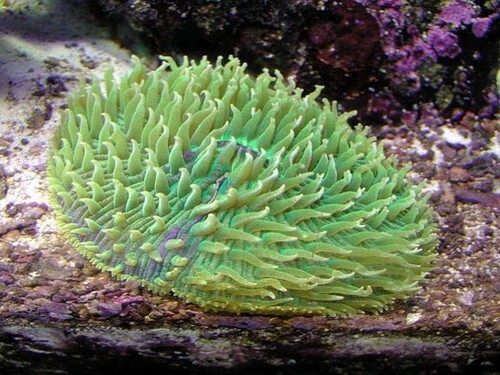 Blastomussa wellsi is a very durable coral tolerating a wide range of lighting and water quality perameters. This uncommonly beautiful red specimin has been in captivity for many years. Whenever I am asked for advice about starting a reef aquarium, I always respond by asking, “Are you sure you want to do this”? An annoying response perhaps, but one which cuts to the heart of a lot of issues that surround the ultimate success or failure of many aquarists. 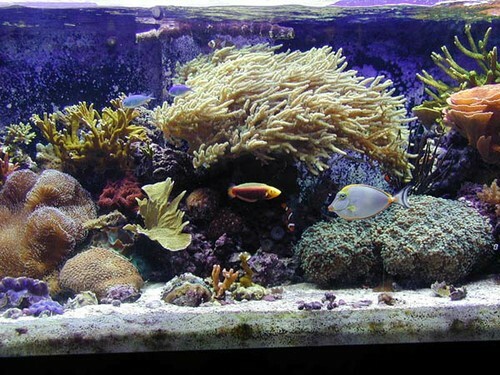 Setting up and properly caring for a reef system is time consuming and costly. While we all strive for efficient, low maintenance, self-sustaining marine systems, novices should understand that a casual relationship to your reef is not realistic. The commitment to the animals in our care is long-term and needs to be taken seriously. It has been my experience that novices who carefully consider these realities and then decide they want to proceed are far more likely to succeed than those who don’t. 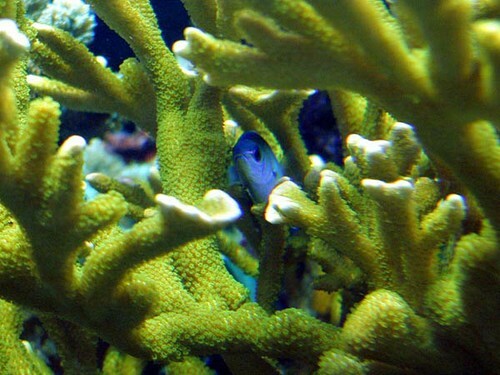 system matures, the relatonships between corals and fish begin to resemble those found in nature. Here a Green Chromis (Chromis virdis) finds a natural refuge in the branches of a green Montipora digitata. So how much of a time commitment does one have to make? This is a hard question to answer definitively, but I can say with confidence that you will end up investing far more time than you initially think you will. Moreover, you may not even realize it until something changes and you no longer have that time to give. Let me give you a personal example. I have always felt the need to reserve at least 15-20 minutes a day to deal with the minimum requirements for my system, dealing with things like calcium supplementation, top-off water, feeding etc. I also budget an additional 2-3 hours a week for more substantial tasks like cleaning the glass, maintaining the skimmer, and observing the system and its inhabitants for changes that may indicate the onset of problems. Additionally, I always cleared the better part of an afternoon once a month to deal with larger maintenance issues like cleaning pumps, changing light bulbs, water changes, testing water quality, pruning and general fiddling with things. I haven’t even mentioned the endless hours of pleasurable amusement watching, talking about, and shopping for this wonderful undertaking! About a year ago marked the joyous arrival of my son Alexander in my life. I no longer have those afternoons to play with my systems as playing has taken on a whole new meaning for me. However, my systems do suffer from the lack of attention. Things that should get done don’t, and things that must get done don’t get attended too as frequently or as soon as I would like. My point here is that as your life situation changes so does the level of attention and care to your reef system. It is helpful to think about this before you decide to get started. If you are planning to make some significant lifestyle changes in the near future, maybe now is not the time to start dabbling with reef tanks. large, single polyped species appropriate for the home aquarium. While reasonably hardy under stable conditions, I would not recommend this coral to true novices. The specimin pictured here is thought to be aquacultured in the South Pacific presumably the result of budding off of a mother colony. Once you’re convinced you are willing to make the time sacrifices necessary to succeed you need to think about how much money you are willing to spend. Without a realistic budget, you can’t plan much further. Beautiful reef systems can be achieved in a variety of sizes, with a variety of approaches, and for greatly varying price tags. None of them come cheaply. There are lots of hidden costs, and I would suggest you pad your budget accordingly. If you are handy, you can save a lot of money building your own components. If you’re not, you need to research your purchases carefully or be prepared to buy a lot of stuff you ultimately don’t need. Once you have a budget in mind, you really need to start doing a lot of reading, and asking a lot of questions. You need to evaluate the physical space the system will occupy. How much weight can the floor hold? Is there an accessible water supply? How about electrical outlets? Things like proximity to windows have real impacts on captive systems. Noise is another consideration. Really, there is a lot to think about. 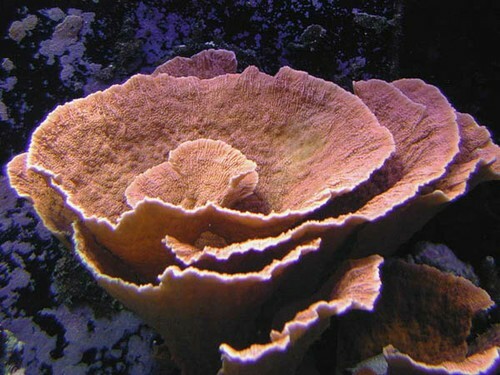 Montipora capricornis is a very popular coral that is readily available as captive raised fragments. It is hardy, fast growing, and forms beautiful cupping formations in the aquarium. 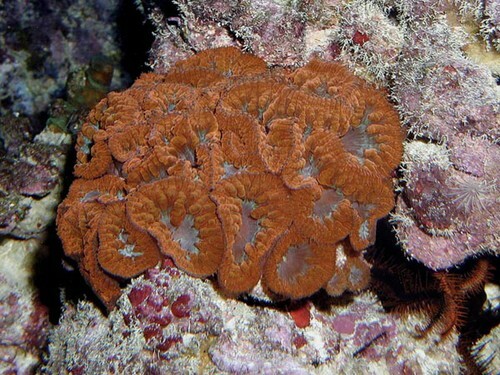 One of my personal favorites, the red morph pictured here is one of the center pieces of Pratt Reef. 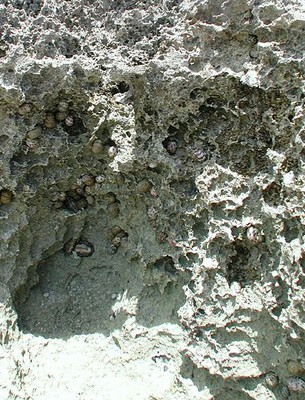 Most important of all, you need to think about what kinds of organisms you want to keep. Ultimately, this will determine the type and size of the system you put together, the kinds of equipment you need to acquire, and how much this is going to cost in time and money. My recommendation is that you take a step back and read actively. Develop questions you want answered and familiarize yourself with the language and concepts of the hobby. I’ll be available to help you in the interactive forum of this publication. Seastars like this Fromia species are beautiful and reef safe, but they are delicate with a spotty record of survival in captivity. 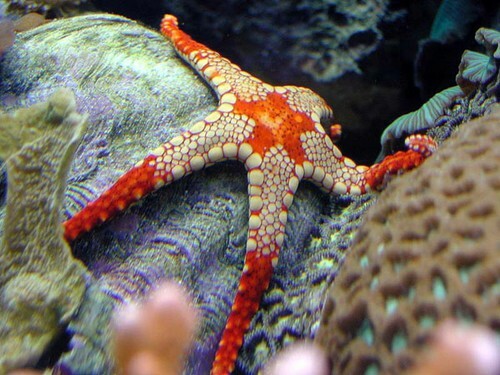 All Seastars must be acclimated very slowly to aquarium conditions and are especially sensitive to rapid changes in salinity and pH. Those of you, who are beginning now, are fortunate that there is a wealth of quality information readily available to you. There is no better way to succeed in this pursuit, than to arm yourself with accurate and useful information. There are wonderful books, magazines and web resources that can give you a tremendous start in the right direction. If you are reading this article, you have already found your way to Reefs.Org. This is a wonderful place to start your inquiries and I suggest you browse through the archives and FAQ files. My next column will take a closer look at some of these resources and help you to focus your inquiries more efficiently. I hope this column will prove useful to you, as I intend it to address directly and clearly things that novices need to know to successfully become “advanced aquarists”.